Sir Michael Marshall was educated at Eton College and read History at Jesus College, Cambridge, where he also gained his Rowing Blue and rowed for Great Britain. Prior to attending university Sir Michael, MA, CBE, DL, FRAcS, FIMI, completed his National Service as a pilot in the Royal Air Force between 1950 and 1952. He joined the family business in 1955. In 1963 he was appointed Managing Director of Marshall (Cambridge) Limited – now Marshall Motor Group – and was appointed Deputy Chairman of the Marshall Group of Companies in 1965. He became Group Chairman and Chief Executive in 1989. 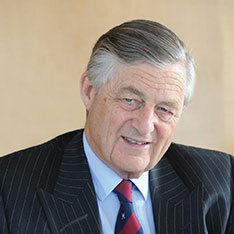 In 2011 he handed over his responsibilities as Chief Executive to his son, Robert, and Sir Michael remains Chairman of the Group.